Click the button below to add the Cure n Seal to your wish list. A water clear 100% acrylic solution surface lacquer sealer for exterior and interior use on concrete, masonry, and aggregate surfaces. The resin has superior ultra violet light resistance and does not yellow on exterior exposures. It is specifically designed for ease of maintenance due the ability to redissolve into itself when recoating after aging. The film has superior resistance to traffic and most water and oil based common chemicals. Properly sealed surfaces have excellent food stain resistance. Available in gloss only. Weight per gal. 10.1-10.4 lbs. Remove dust, grease and oil deposits. New floor installations should age a minimum of 60 days. Exterior concrete floor surfaces, (particularly new surfaces) which are steel trowel finished, should be acid etched to insure proper penetration and adhesion. The surface must be thoroughly raised after etching to remove excess salts. Surface must be thoroughly dry for 48 hours to prevent peeling. Surface temperature must be above dew point. Cure and Seal is best applied by spray in thin surface wetting coats. The first coat in intended to penetrate deeply and should almost disappear into the substrate. (On extremely smooth or hard substrate one coat should be enough). The second coat will redissolve the first coat and drive it deeper into the substrate. A uniform slight sheen might result after the second coat. 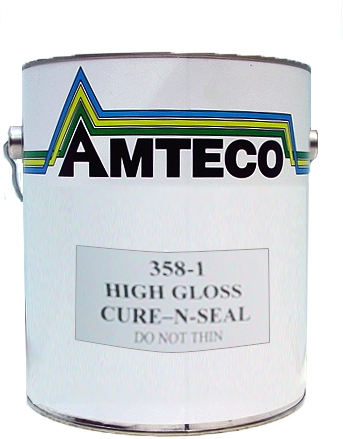 A third coat may be required on very porous substrates. The porosity and temperature of the substrate are important influences on exact amount of sheen obtained and resulting surface wear characteristics. Porosity of the substrate will determine amount of product needed for each coat. CAUTION: Respirators must be worn when applying these materials. Do not smoke or apply near open flame. See Material Safety Data Sheet for additional safety handling information. Surface must be thoroughly dry for 24 hours. If moisture remains, white spots and/or disbonding may result. Remove spots with Trimethyl benzene then apply another light coat. If material is applies in a heavy single coat, peeling, disbonding and premature wear patterns may result. 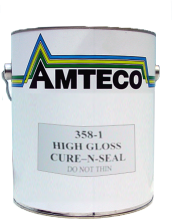 Cure and Seal can be applied by brush, roller or spray. If surface temperature is above 80 degrees F, apply by spray only. Equipment must be compatible with Penalomethane (equipped with Viton/Teflon and stainless steel parts). A: Roller Application: Use 3/8" Pronell nap or standard 1/4" nap other for paint roller applications. Apply the material by pushing the roller up and back in a vertical direction. Do not apply side to side roll with the broom strokes of the concrete). Roll quickly so as not to allow product to cure on the surface before penetrating into the substrate. Allow first coat to dry 2 to 4 hours before applying a second coat. B: Spray Applications: Spray light coat with 50% overlapping strokes. Wait 2 to 4 hours before spraying second coat. slight sheen might show after show after second coat is applies. Uniformity of sheen will depend on the uniformity of the porosity and application technique. Recommended spray tips and pressure 0.017-0.019, tip orifice at 900-1200 p.s.i. After 24 hour cure, flood AWR treated surface with water to ensure water seal. Mark dark area indicating water penetration. After 24-48 hour dry time, apply AWR to marked areas and repeat process to ensure water seal if necessary. DO NOT LEAVE PUDDLES ON HORIZONTAL SURFACES! 30 min. at 77f. Dry hard; 1-2 hours. Recoat, 2 hours. Thinning not required except during high temperatures. Thin with 1 qt. xylol per gallon when surface temperature exceeds 95 degrees. Use xylol for equipment cleanup. Recommended for driveways, garage & basement floors, brick, stone & concrete walkways & patios. Eliminates water, soil & oil absorption into the surface when properly applied.